One of the youngest disciples of Pt. Radhika Mohan Maitra, Joydeep grew up in a family of genuine music lovers. Pandit Anil Roy Chowdhury, one of the senior most disciples of Radhika Mohan, opened the doors of Indian Classical Music before a four year old Joydeep when he took him under his wing. Later, when Joydeep grew up a little bit, both in maturity and dexterity, Roy Chowdhury took him to his guru, Pt. Maitra. Joydeep was soon being groomed to become a fine musician under Radhika Mohan’s watchful eye and performed with him on many occasions. After the maestro’s untimely death, Joydeep started to take lessons from Pt. Buddhadev Dasgupta and Pt. 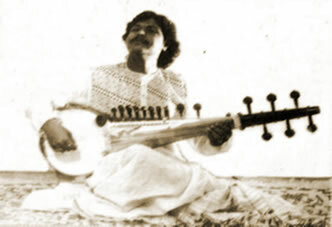 Bimalendu Mukherjee, a doyen of the famous Imdadkhani Gharana of Sitar and Surbahar. Having been enriched by the training of two different Gharanas or Sarod and Surbahar, Joydeep has developed a technique of playing the Sarod and Sur-Shringar of his own. Joydeep has also received training in Tabla under Pandit Amal Sarkar, Ustad Shaukat Ali Khan and Anil Palit. To complete his training in Indian Classical Music in all aspects, he has also received lessons in vocal music from Pt. Amaresh Chandra Chaudhury. Joydeep is the recipient of many awards including the National Talent Search Scholarship of the Government of India. In 1978, he was awarded the first prize in the Instrumental group of the All India Radio Music competition. He has a ‘Sangeet Praveen’ (M. Mus) diploma from Prayag Sangeet Samiti in Allahabad, coming first in an all India rank with Gold Medals in four areas. This talented Sarodia has performed in major music conferences in almost all major cities of India, the Sangeet Natak Academy Music Festival and the Ustad Hafiz Ali Khan Memorial concert, being worthy of special mention. He has toured across Europe playing in concerts in England, Germany, France, Holland, Sweden, Norway and Denmark. Joydeep now lives in Khairagarh in the state of Madhya Pradesh in India, where he is a senior lecturer in Sarod at the Indira Kala Sangeet University.